This photograph was taken in the mid-1950s. The house was built in 1903 and the site is now occupied by a block of flats 'Whitefriars Court'. Please see image number 3334 for class photograph and further comments from former pupils. I lived at 28, Cardrew Ave between 1937 and 1950 my friend Derek Adams lived in Cardrew Close and he went to Comrie House School during WW2, I went to Holly Park School. I was at Comrie House School between 1946 - 1950, anyone still around ? What happened to my picture and the rest of the school pictures? THE ONLY OTHER PICTURE WE HAVE IS NUMBER 3334. DID YOU UPLOAD THE PICTURES? I was at Comrie House from c1946 to 1952. I've seen picture 3334 but don't recognise anyone in it. But some of the faces seem to be a bit familiar (not very good with faces I'm afraid!). But it may be that I started in 1947, but I don't have any records of it. The picture was taken in 1945 or 1946 I can't remember which! Roy, you mentioned other pictures that apparently have not been published. What are they of? The school and/or pupils? Do you still have copies? David there were other pictures beside the school photo but at sometime they were taken off. They were of various classes throughout the years. That's what I meant by other pictures. Where they went I don't know. I was in Comrie from 44 to 47, then to Henrietty School Barnet. Looking at photo of class in 1946 from Roy Johnston, with many names submitted by Rev Grenda Hurt( nee Horne). With Pamela Nicholls we can name majority of that class. My younger brother followed 3 years after. Hi I was at Comrie House at about 1954 till about 1966. I was a twin. The comments added in by Steven Bennett and the other names he mentions were names that I remembered. It was only last week that I was looking at all the black & white photos I took of my stay at Comrie House from 1954 to 1966. Does anyone still have contact with former pupils of their years, I have one. I remember the Winterburns & Mrs Harden in the wheelchair. I even fought the son of the Winterburn's in the first round of the school boxing tournament. Hi my brother John Winterburn must be who you remember, sadly no longer with us. 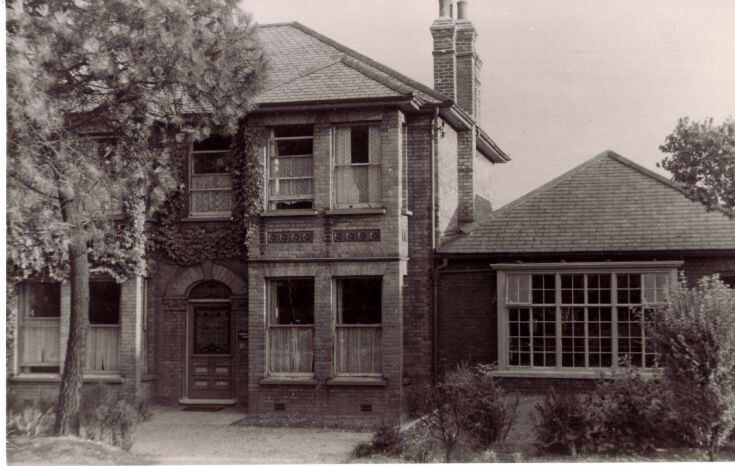 My mother (Irene Hayden) worked here as a 'Live-in Assistant' in about 1928/29 when she was 19/20 yrs old. She used to cook lunch for 25 children and sometimes looked after the proprietor's two young sons (aged 9 & 12) while their parents were away. The proprietors of Comrie House School in 1928 were a Mr & Mrs Quilliam. Mrs Quilliam was a teacher and ran the school. Mr Quilliam was Deputy Headmaster of Finchley Grammar School and possibly Headmaster later. I was there 1962-67...I think. Remember Mrs Harnden as head. Teachers Miss Hawkins? Mrs Rogers. My year fellow students were Keith Elmes, Elizabeth Cole, Gillian Cutbill. Especially remember Sports Day, the sweet tray lady and dinner assistant Mrs Pearce who was lovely ! I was at Comrie House between 1962 and 1966. My grandparents - Mr and Mrs Winterburn, owned Comrie House School. It was passed from Mrs Winterburn to their eldest daughter Maisie Harnden, who was in a wheelchair. During WW2 the front room was bombed. As a lot of the staff went into the forces my mother, Constance Winterburn, then 16 years old, left school herself to fill a teaching position at the school. I remember the name of Irene who was housekeeper/companion there. Not the same dates as the previously mentioned Irene so must be a different lady.If I remember correctly she was excellent at smocking and used to smock dresses for me during the late 50's and early 60's which Auntie Maisie would send to me for Christmas - we were in Rhodesia at that time. Sadly my cousin Diana Dowling who commented in 2016 has recently died. I believe my Uncle Arthur Harnden sold the school in the mid seventies when he retired. Does anyone remember the donkey in the sports field next door? I went to Comrie from 1949 to 1955. Yes, at one time there were two donkeys, Polly and Neddy, who were kept in a stable by the boys' toilet. A boy was deputed to ‘muck out’ until his mother complained! I can also remember the day when my teacher Miss Perry came into the classroom to announce that Mrs. Winterburn had died. When Maisie Harnden became head she would ring a bell to summon the duty monitor from Form 1/2 to run an errand! Part of ‘prefect’ duty was to walk across the terrace ringing a brass bell to indicate change of lessons. Another duty was to bring in the milk crates and put them in front of the coke fire in the winter! I’ve just seen an entry ifrom David Everall. If I’m right you had a brother called Robert and you lived in a big house in Woodside Park Road, on the right towards the station? Hi Richard. Yes you are right! The house was converted into flats. We lived on the third floor if memory serves. I now live in Caerphilly (South Wales) and Bob lives in Budleigh Salterton South Devon. I'm afraid my memory now of Comrie House is very vague! Although of course Mrs Winterburn and Mrs Harnden I recall. Don't remember the donkeys!!! I think my problem is that I was very shy!! Bob was always far more outgoing and would probably remember them! I'll send him a link to this site and he may well be interested. Thanks David, I can remember a number of my classmates which may ring a bell: - Lyn Bickers, Susan Fineman, Stewart Patterson, Raymond Pullen, Linda Hayes, John Cardell, Francis Holliday, Diana Salmon, John Norman (who I still see regularly), David Grindrod, Paula Challenger, Janice Verando, Trudy and Sally Taverner, James Davy, Paul Gold, Pat Comber, any others? Richard thanks. However of all those names the only one that rings a bell is Pat Comber! I must have been madly in love with her!! !